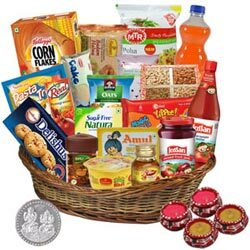 Order online this Someone Very Special Gourmet Gift Hamper and make your near and dear ones happy on this Diwali. This Gift Hamper is the assortment of Britannia Cakes - Milky Masti (65Gm), Sunfeast Delishus Gourmet Cookies - Nuts and Raisins (75Gm), Dry Fruits (500Gm), Kelloggs Corn Flakes - Real Almond and Honey (300Gm), Quaker Oats - Homestyle Masala (40Gm), Sunfeast Pasta Treat (70Gm), MTR Poha (60Gm), Sunfeast Yippee Noodles - Magic Masala (280Gm), Haldirams Mix - Bhel (70Gm), Haldirams Badam Halwa (200Gm), Kissan Ketchup - Fresh Tomato (500Gm), Kissan Jam - Mixed Fruit (700Gm), Dabur Honey (100Gm), Amul Butter (100Gm), Real Fruit Juice - Pomegranate (1Lt), Bru Coffee - Gold (100Gm), Amulspray Milk Powder (100Gm), Sugar Free Natura - Sweetener Sachets (50Pcs Pouch), Fanta Soft Drink (600Ml), 1 Laxmi Ganesh Silver Coin and 4 Diyas in a Gift Basket. Flowers Delivery Bangalore, Send sweets Solapur, Wedding Cake Madhyamgram, Diwali Mithai Raichur, Send Flowers and Gifts to Rajkot, Online Shop Gwalior, Flower to Lucknow, New Year Flowers Ajmer , Fresh Fruits Gadag, Send Gift Solan, Dry Fruits to Ahmedabad, Birthday Delivery Rajkot, Sending to Ratnagiri, Flower shop Proddutur, Gorakhpur Online Cake Delivery.